We’d love your help. Let us know what’s wrong with this preview of Rise and Grind by Daymond John. Daymond John knows what it means to push yourself hard--and he also knows h New York Times bestselling author of The Power of Broke and "Shark" on ABC's hit show Shark Tank explores how grit, persistence, and good old-fashioned hard work are the backbone of every successful business and individual, and inspires readers to Rise & Grind their way the top. To ask other readers questions about Rise and Grind, please sign up. Keep up the good work, my brother. FUBU was one of my favorite brands growing up. That makes you one of my favorite people. This book was a waste of time. After having listened to over 100 books from Audible, this is the first one that resulted in me asking for a refund (side note: refunds are remarkably easy to get from Audible!). The book is full of cliches and hype. Rise and shine. Early to bed, early to rise. Crush it. Meh. Most of the content of the book centers around the stories of people who have accomplished big things in their lives. However, in my opinion, most of their stories don't tell anything motivatio This book was a waste of time. After having listened to over 100 books from Audible, this is the first one that resulted in me asking for a refund (side note: refunds are remarkably easy to get from Audible!). The book is full of cliches and hype. Rise and shine. Early to bed, early to rise. Crush it. Meh. Most of the content of the book centers around the stories of people who have accomplished big things in their lives. However, in my opinion, most of their stories don't tell anything motivational. The worst was Wendy Williams' portion. It rambled on and on about her kids' eating habits, her makeup routine, and other non-essential filler. I learned about this book while watching Daymond John on the morning radio talk show The Breakfast Club with Charlemagne Tha God. On this show John described his book as a guide for readers so that they may learn the morning rituals and activities of some of the most successful people in the business world. As a woman on a journey to becoming her best, this book sounded like something I would really be interested in reading. So I purchased the book the next day. As much as I would like to say Ri I learned about this book while watching Daymond John on the morning radio talk show The Breakfast Club with Charlemagne Tha God. On this show John described his book as a guide for readers so that they may learn the morning rituals and activities of some of the most successful people in the business world. As a woman on a journey to becoming her best, this book sounded like something I would really be interested in reading. So I purchased the book the next day. As much as I would like to say Rise And Grind is a must read for anyone looking to take their grind to a higher lever...I cannot. Instead, Rise and Grind read to me like a book of bios detailing the life and accomplishments of the author’s business partners and associates. With a total of eight chapters, there are fifteen different people interviewed in the book. Some of these individuals include television talk show host Wendy Williams, actress Catherine Zeta-Jones, Grammy award winning artist Carlos Santana and Pastor Joel Osteen. Each person was asked to share their day-to-day habits and routines so that the reader may see how some of the world's most successful people make the most out of a 24 hour day. In theory this is an awesome concept. However, I believe John failed in the execution. I would have enjoyed the book much more if he did not spend so much time providing background information of each of the individuals featured. John spent more than half of each person's section telling the life story of the featured individual. Then he spent even more time detailing his relationship with that individual. After all of this information was given he finally provided a few quotes from the interviewee, giving the reader a glimpse into his or her day-to-day habits and rituals. The disconnect I experienced with this book came from the author providing so much background information, that I began to lose interest with each story. Of all the chapters in the book my favorite was Chapter Six: Grind All Night. In this chapter John discussed the importance of business owners putting themselves in the environments that exposes them to as many different people, brands, and trends as possible. He uses himself as an example by explaining why he continues to frequent nightclubs at the age of 48. In this chapter he also stresses the importance of putting, "yourself where the deals happen". Meaning, if you are on your grind, you should always network where your market lives and breaths. This is how you learn what the latest trends are within your industry. It's how you get a leg up on the competition and stay connected to the consumers in your market. In summary, yes...there are some sections within Rise and Grind that contains insightful words of wisdom. And yes, some of the stories in the book are inspiring. But overall, there were not enough aha moments for me to give this book my stamp of approval. Rise and Grind’s content doesn’t match the title. The phrase “rise and grind” is authentic and gully. It’s the antithesis of “Fake It until You Make It.” It means put your nose to the grind and get stuff done. Thus, as an entrepreneur, I was immediately drawn to a book with such a title. However, with respect to Daymond John’s book, the title Rise and Grind is a misnomer. John managed to interview some successful people but presented his work as a selection of celebrity profiles that fail to extr Rise and Grind’s content doesn’t match the title. The phrase “rise and grind” is authentic and gully. It’s the antithesis of “Fake It until You Make It.” It means put your nose to the grind and get stuff done. Thus, as an entrepreneur, I was immediately drawn to a book with such a title. 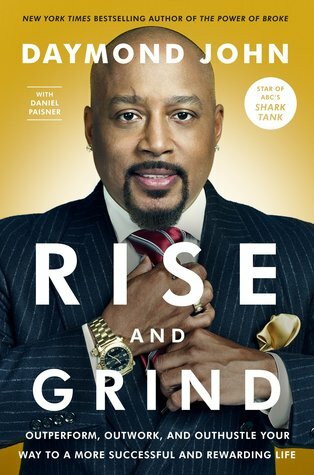 However, with respect to Daymond John’s book, the title Rise and Grind is a misnomer. John managed to interview some successful people but presented his work as a selection of celebrity profiles that fail to extract the subjects’ processes or their philosophies or any information useful to the reader or true to the “rise and grind” theme of the book. John basically presents the life stories of his subjects (e.g., Catherine Zeta-Jones dropped out of high school, and Kyle Maynard was born handicapped, etc.) and says look how successful they are. If they can do it, so can you. Inspirational, perhaps, but not practical. It fails to identify what’s in these successful people and whether it can be learned later in life. How are some people able to keep pressing even after they’ve made their name and their money? How are some people able to grind it out on days when they can’t summon their best talent or keenest focus? I usually don't care for books where an author uses his platform to write a book which is only half the author's contribution and the other half is the success stories of others, but this is a rare exception. I enjoyed this book. This book was fantastic, like having informational interviews with the most successful people in the world. I liked the emphasis on different strategies for success, even some that were in direct contradiction with each other, to show that achievement looks different for everyone and there is no one way to be successful. I also appreciated the emphasis on taking care of yourself to position yourself to be successful. Will recommend! I really wanted to love this book, as I think Daymond John is a super successful businessman and impressive in what he has accomplished. My favorite parts were the chapters when he related his experiences and what he does to grit and persistence. I didn't find the other stories from other professionals to be as educating or as entertaining. For me, his other books are much better. We are dumbfounded. Normally, when quiet people start talking, it's nothing that you want to hear. Normally. However, John has a lot to say. He lays it out clear, in easy-to-digest pieces. Well, there is a ton of information here. It might be wisest for you to pull out the most germane for your situation and begin a note file on your hard drive. Rise and Grind reads somewhat like a who's who in the business and entertainment industry. This is not a bad thing when the author knows these We are dumbfounded. Normally, when quiet people start talking, it's nothing that you want to hear. Normally. 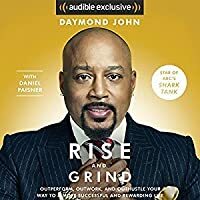 In Rise and Grind, ultra successful FUBU CEO and Shark Tank mogul Daymond John interviews and shares tips from people across the spectrum of success - an actress, a singer, inventors, salespeople, athletes, even a pastor - about how they became successful and what they do to keep rising. I liked the format of the book where John interspersed these third party stories with vignettes from his own experiences as well as the web address included at the end of each checklist that links to quote cards In Rise and Grind, ultra successful FUBU CEO and Shark Tank mogul Daymond John interviews and shares tips from people across the spectrum of success - an actress, a singer, inventors, salespeople, athletes, even a pastor - about how they became successful and what they do to keep rising. I liked the format of the book where John interspersed these third party stories with vignettes from his own experiences as well as the web address included at the end of each checklist that links to quote cards from each celebrity guests that you can use for a vision board or post on social media to inspire someone else with their powerful words. Rise and Grind includes advice for accomplishing work, relationship, spiritual and health goals and is both general enough and specific enough for almost anyone to connect with. The SHARK TANK TV star, Daymond John, mixes his self-help advice with that of 17 others who also have a successful work ethic. After all, not everyone is an only child who has dyslexia, channels the urban fashion aesthetic by growing up in the Hollis neighborhood of Queens, or has the stamina to launch a business by spending five years working an 8-hour shift at Red Lobster; sewing, tagging, and delivering hats; and sleeping three hours a night. To be successful, according to Catherine Zeta-Jone The SHARK TANK TV star, Daymond John, mixes his self-help advice with that of 17 others who also have a successful work ethic. After all, not everyone is an only child who has dyslexia, channels the urban fashion aesthetic by growing up in the Hollis neighborhood of Queens, or has the stamina to launch a business by spending five years working an 8-hour shift at Red Lobster; sewing, tagging, and delivering hats; and sleeping three hours a night. To be successful, according to Catherine Zeta-Jones, you might have to move to London when you are 15, or, like Gary Vaynerchuk, your parents might have to bring you to the USA from the USSR when you are two. "Tyler, the Creator" uses a kind of Leonardo da Vinci genius approach by sitting in a tree to think, carrying around a notebook to record new ideas, and coming up with entertainments for festivals. Really dug it....like anything, you won't agree with everybody or want to emulate every person in the book, but there is plenty here to learn from or reinforce what you already do. I believe this would be a great book in particular for high school and college students looking to find a routine for themselves. My family and I used to enjoy watching Shark Tank on TV. Of all anchor and guest Sharks, Daymond was my least favorite. To me, he seemed pompous, rude, and sometimes right out bully (I was bullied in school, so I don’t like bullies). For that reason, to fulfill my plan of reading one book written by each Shark each year, I kept pushing Daymond’s book down the waiting list. I though I had nothing to learn from a guy like him. I was wrong. So far I’ve read Mark Cuban’s How To Win At The Sport Of Bu My family and I used to enjoy watching Shark Tank on TV. Of all anchor and guest Sharks, Daymond was my least favorite. To me, he seemed pompous, rude, and sometimes right out bully (I was bullied in school, so I don’t like bullies). For that reason, to fulfill my plan of reading one book written by each Shark each year, I kept pushing Daymond’s book down the waiting list. I though I had nothing to learn from a guy like him. I was wrong. So far I’ve read Mark Cuban’s How To Win At The Sport Of Business, and Robert Herjavec’s You Don’t Have To Be A Shark, but both left me a little disappointed. I wanted to read Barbara Corcoran’s Use What You’ve Got, but while searching for it, Daymond’s book keep showing up, so I though I might as well get it over with and bought it. My son Pato is a movie expert. A few years ago I wanted to see Pixar’s animated movie Up and I asked for his opinion. He said that the movie was okay, but it had the best first 10 minutes of a movie ever. According to Pato, the Director was able to compress a life long love story in a descriptive, elegant, and emotional manner in just a few minutes at the starting of the movie, so that the real story could begin. Well, I feel the same way about Daymond’s book. The book’s title, Raise And Grind has been, and still is, my work motto. I rather be in the company of people who try and fail, and try again, than people who don’t like to work. Against people who don’t want to work, there is no defense. The first few chapters are all about the necessity to get up and work hard, without quitting. Personally, I think that is the only way to make it, unless you are planning to win the lottery or to receive a big inheritance (non of which apply to me). Of course, grinding all day does not guarantee success, but it is the mandatory first step. Daymon’s book features the stories of many of the entrepreneurs that have made deals with him on Shark Tank, but most of them sound more like a promotional pitch for their products. Only for that reason, I took one star in my rating. But even then, you always have something to learn from everybody. Reading Daymond’s life story, and his work ethic has given me a new perspective and appreciation of him. I don’t watch TV that much, but if I catch another episode of Shark Tank, I will be rooting for him to strike a deal. New York Times bestselling author of The Power of Broke and "Shark" on ABC's hit show Shark Tank explores how grit, persistence, and good old fashioned hard work are the backbone of every successful business and individual, and inspires readers to Rise & Grind their way the top. It might be convenient to believe that you can short-cut your way to the top, but the truth is that if you want to get and stay ahead, you need to put in the work. You need to out-think, out-hustle, out-perform everyone around you. You've got to 'rise and grind' every day. In the anticipated follow-up to the bestselling The Power of Broke, Daymond takes an up-close look at the hard-charging routines and winning secrets of individuals who have risen to the challenges in their lives and grinded their way to the very tops of their fields. Along the way, he also reveals how grit and persistence both helped him overcome the obstacles he has faced in life, and ultimately fueled his success. This was an amazing book Rise and Grind was everything I needed to hear. If your looking for a book to help you “Light A Fire” under you than this book is definitely for you. Mr. Daymond John had me hooked from the very beginning I’m talking page one. This is definitely a must read for anyone who gets up everyday wanting more for their life an needing some tough love to help you along the way. I received a copy of Rise and Grind by Daymond John from BloggingForBooks in exchange for my honest review. The book Rise and Grind is a nonfiction book by Daymond Johnson. The book is voiced through him and it is about his upcoming in life and how he made it through all the struggles he had and he kept grinding. However, the purpose of this book is not to tell the story of his life and how he became who he is, but it is about putting that same drive that he had to work and grind into the reader. 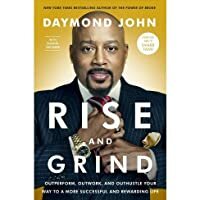 He says to find things you like doing and pursue them, no matter what it is, if you work hard enough you w The book Rise and Grind is a nonfiction book by Daymond Johnson. The book is voiced through him and it is about his upcoming in life and how he made it through all the struggles he had and he kept grinding. However, the purpose of this book is not to tell the story of his life and how he became who he is, but it is about putting that same drive that he had to work and grind into the reader. He says to find things you like doing and pursue them, no matter what it is, if you work hard enough you will succeed. Throughout the book there are also chapters where other people takeover and tell their story of their path to success. One example of this would be in chapter three, when Tyler the Creator takes over and talks to the reader. He says that everyday he would write raps and record new betas and that music was always on his mind. Tyler claims that he was young when he fell in love with music and started to write songs at the age of nine, even though they were never produced. Tyler did everything to get his music out to the public. For his first album release he wanted to through a huge block party, but the city of San Francisco wouldn’t let him, so he through a Carnival in a parking lot of Cosco. These same beliefs that Tyler had were the same for Daymond, they both worked hard everyday at something they were truly passionate about. By telling his story and many others, he wants to bring the inner grind out of you, so you, yourself, the reader can be successful in life or whatever you choose to do. "Power Fact: 76% of so-called mom-preneurs used their personal savings as a primary funding source...what I take from this stat is that women are often passionate about their new businesses, and willing to bet on themselves." I received a copy of this book from bloggingforbooks.com in exchange for an honest review. Watching Shark Tank is my guilty pleasure and I became familiar with Daymond John through the show. I haven't read any of his other books but this is less a book about Daymond and more "Power Fact: 76% of so-called mom-preneurs used their personal savings as a primary funding source...what I take from this stat is that women are often passionate about their new businesses, and willing to bet on themselves." Watching Shark Tank is my guilty pleasure and I became familiar with Daymond John through the show. I haven't read any of his other books but this is less a book about Daymond and more a book by Daymond. Daymond shares the stories of other people he considers successful and what they did to get where they are. The stories are all fairly short - not more than a few pages each followed up a checklist summarizing the take aways from each person and more information available through a listed web link. In that sense this book is fairly interactive and not just for reading through. Alright alright so one more self-help book on motivation for budding entrepreneurs with no significant difference than other books out there by people such as Tim Ferris, Grand Cordone or Gary Vaynerchk. Same format with chapters based on famous celebrities and go-getters on how they rise and grind, what's their work philosophy, what are their priorities, etc. Reminds of Vaynerchuk's book Crushing It that follows the exactly same format of talking about how people made it. Overall, it is an ok bo Alright alright so one more self-help book on motivation for budding entrepreneurs with no significant difference than other books out there by people such as Tim Ferris, Grand Cordone or Gary Vaynerchk. Same format with chapters based on famous celebrities and go-getters on how they rise and grind, what's their work philosophy, what are their priorities, etc. Overall, it is an ok book with no groundbreaking material with same message if you want something you have to make it happen by whatever way you need to. In my opinion if you have read books from other authors on similar topic you can safely bypass this book. That being said I feel Daymond John really wants to cultivate entrepreneurial spirit in people which is the motivation behind this book. The last chapter is a little personal when he talks about his thyroid cancer and how he views life after that incidental discovery. The two most important days in your life are the day you are born and the day you find out why.” – Mark Twain. So go figure out the second one if you haven't already. It was like throwing rocks at a glass doll house and hoping not to break it while trying to get through the total space voids of the book because the topics are so far and beyond what I thought I would read. WHo cares so much about materialistic things and times that are not going to help me out at all. Maybe it is selfish of me to want to read this book and learn a thing or two, but it seems more like bad interviews then a motivational speech. More name drops an I received a complimentary copy. I've been doing quite a bit of reading lately on intrinsic motivation, perseverance, drive and grit. When Shark Tank's Daymond John published "Rise and Grind" earlier this year and then joined Chelsea Krost for a TwitterChat, I new it was a must read. Authentic insightful and inspiring, Daymond weaves the journey of his rags to riches tale along a path of themes. He then introduces others who provide greater depth and perspectives of those themes by sharing their rise & grind motivations. Hard not to be energized by the process of studying others drive. I really enjoyed this book, the varying principles & numerous interviews. I felt Daymond did a good job of using a similar style as Power of Broke but still got great and different details from each story. He also did a good job of pooling from people of varying backgrounds: moms, TV hosts, serial entrepreneurs, musicians, etc. That provided a realistic view of how anyone can accomplish their goals despite their background. If you're looking for really new ideas, this book probably isn't going to deliver. Motivational books like this tend to have a lot of the same themes and generalities about working harder and smarter. But it's enjoyable enough and a lot like exercise - it's not about doing it once. To get the benefits of motivational books, you really have to hear these themes over and over anyway, so I don't mind a slightly new take. A young entrepreneur, an industry pioneer, a highly regarded marketing expert, and a man who has surpassed new heights of commercial and financial success are just a few ways people have described Daymond John. Over the last 20 years, Daymond has evolved from one of the most successful fashion icons of his generation to one of the most sought after branding experts, business, and motivational spea A young entrepreneur, an industry pioneer, a highly regarded marketing expert, and a man who has surpassed new heights of commercial and financial success are just a few ways people have described Daymond John. Over the last 20 years, Daymond has evolved from one of the most successful fashion icons of his generation to one of the most sought after branding experts, business, and motivational speakers in the country.